We have had fantastic support from our local communities in all our fundraising events. Thank you. Sledge Pull Sep '11: Just under £500 was raised from our 11 mile Sledge Pull, that's in addition to the £208 we raised for Scot Polar Research. The 11 miles were done in around 90 minutes, an excellent time considering the ups and downs of our Highland roads! Sixes Day 2011: A total of just over £354 was raised from all our stalls etc at the Sixes Tournament. Huge thanks to all the parents and helpers who manned the BBQ, Teas, Raffle and helped in any way. We couldn't do it without you! Whist Night Feb '11: A total of £46 was raised at the weekly whist night in Rhiconich on 4th February. Many thanks again to Ann Doull and the organisers. Whisky Bottle: A 4.5 litre whisky bottle full of coppers was donated to the Shinty Club by Maurice & Peggy Chatten. We have now counted all the pennies and there was a total of £66 in it. Thank you to our kind donaters and to our jannie, Ross for helping count it all! Collection Jar: A fantastic £97.75 was raised from our collection jar in the KLB Hotel. Once again, thanks to Leona for allowing it on the bar and to all the generous customers who put their money in! Sixes Day 2010: A total of £337 was raised for our funds. Thanks to all the parent helpers who looked after the BBQ, Shinty merchandise etc. A great £121 was raised in the raffle, £60 of which funded the medals and shields for the tournament. The remainder will be used for next years medals and shields. Miles for Smiles 2010: A total of £929.26 was raised on our sponsored dribble from Laxford to Kinlochbervie. A £100 donation was sent to Transplant Sport UK. Thanks to all the parents who helped on the day and thanks to Leona at the KLB Hotel for the much appreciated refreshments. Open Day 2010: We raised £124 at the school open day. Our players organised a Beat the Goalie competition and Spot the Ball. Well done to them all for their hard work. Whist Drives 2010: Thank you to Anne Doull and the Whist Nights - they raised £145 for us, in total, on two nights. Collection Jar: Our jar in the Kinlochbervie Hotel has raised £77 from Dec 08 until June 09. Thanks very much to all the customers who put money in and to Leona for letting us have it there. 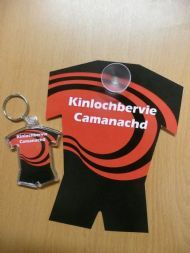 New Merchandise: We have now got Kinlochbervie Camanachd keyrings and in car signs for sale! We have sold a lot already will be selling at the KLB Gala Day, the Durness Games and of course here at the school. See picture below: Keyrings £2.00, Car Signs £1.50. Sixes Day 2009: Many thanks to all the parents who heped out at our sixes tournament whether doing the barbecue, selling soup and keyrings or just supporting us. We really appreciate it. We made £337 to put towards our fund. From Sea to Summit 2009: We hope to have raised £1500 from our Ben Nevis climb. This is a fantastic amount and we are delighted. Cape Wrath Challenge 2009: Thanks to all the organisers of the Cape Wrath Challenge for inviting us to do the BBQ after the Beach Run. We made just under £320 profit from the evening. A big thanks also to all who helped in any form. Whist Nights: A big thanks to Anne Doull & the organisers of the Whist Nights in Rhiconich. They had two nights for the Shinty Club and raised a total of £171.00. Easter Indulgance Hamper 2009: A total of £209.50 was raised - this will go towards new camans. Thanks to all who supported us. From Sea to Summit: Twelve of our young players are going to attempt Ben Nevis. Yes, Ben Nevis! Saturday 6th June 2009. This will hopefully raise funds to replace our old and broken equipment and help subsidise the transport and fuel costs for trips away. This attempt will cost us in the region of £700 - if you can help or have any ideas please get in touch with us. Many thanks to Loch Duart for donating £75 - our first sponsor! Even More Good News: We have just recieved news (3rd Feb 09)that our application to 2014 Communities/Big Lottery Fund has been successful and we have been awarded £1000 towards our transport & accommodation costs. This means that with the £1000 which we have already recieved from the Duchess of Westminster Charity we are now totally self sufficient for all our trips away this year! Stornoway, Fort William, Inverness, Thurso, here we come!! Good News: We have just recieved news (28th Nov 08) that our bid to the "Anne Duchess of Westminster Charity" has been successful. We have been awarded £1000 for our transport costs for trips away. Fantastic!! (Our transport, fuel and accommodation costs last year were just under £1900). Thank You: Many thanks to Kinlochbervie Hotel for allowing us to keep a collecting jar on the bar. Thanks to them and their customers we raised £55.91 over the summer and £66.25 from August - December. All these donations help us keep the club running and taking the children away to matches. Thank you and keep supporting!!!! !